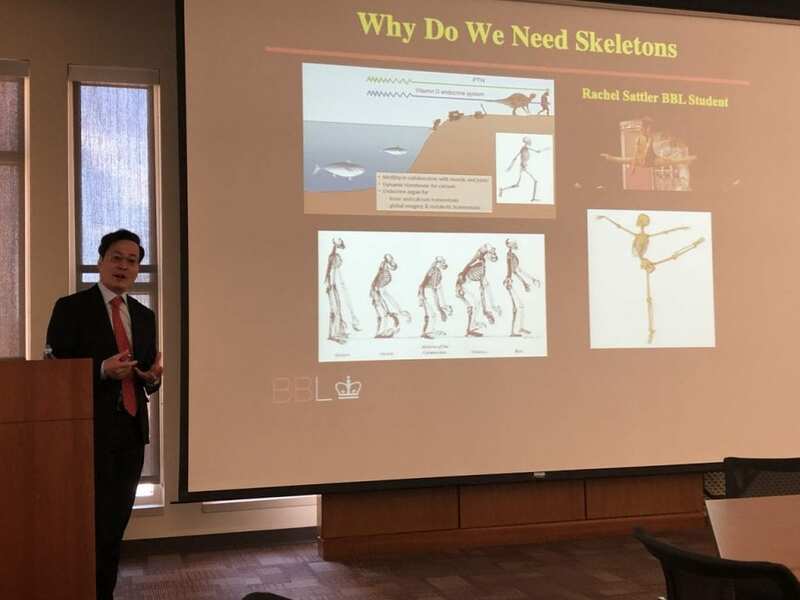 Edward Guo, Ph.D., a Chair and Stanley Dicker Professor for the department of Biomedical Engineering at Columbia University, gave a seminar on Wednesday, March 6th at OU. His seminar was over bone bioengineering: microstructure, mechanics, mechanobiology and beyond. Abstract: Bone Bioengineering Laboratory is developing innovative technology in microstructural assessments, biomechanical modeling, multiscale and mechanobiological approaches in skeletal research. Bone Bioengineering has both basic science and clinical significances in many medical fields, such as osteoporosis, osteoarthritis, or intervertebral disc degenerations. I will highlight our development of a three-dimensional imaging analysis and modeling technique for trabecular bone microstructure, its applications in basic science research of bone mechanics, and clinical applications in osteoporosis and osteoarthritis. We will discuss bone microstructural phenotypes in difference races and their implications in genetic and precision medicine, anthropology, evolution and mechanobiology of the skeletons. In parallel to these developments, we will also discuss our multiscale mechanobiological approaches in understanding the mechanisms of how bone senses and responds to mechanical loading and showcase how mechanobiology links to bone microstructure and mechanics. Biography: Dr. Guo received his M.S. in 1990 and Ph.D. in 1994 in Medical Engineering and Medical Physics from Harvard University-MIT. In 1994-1996, Professor Guo did his postdoctoral fellowship in the Orthopaedic Research Laboratories at the University of Michigan at Ann Arbor with Professor Steven A. Goldstein in orthopaedic bioengineering. In 1996 he joined the Department of Mechanical Engineering and then Department of Biomedical Engineering at Columbia University as an Assistant Professor. He was promoted to Associate Professor in 2001, Associate Professor with tenure in 2003, Professor in 2007, and named as Stanley Dicker Professor in 2018. He directs the Bone Bioengineering Laboratory in the Department of Biomedical Engineering at Columbia focusing his research interests in micromechanics of bone tissue, computational biomechanics, and mechanobiology of bone. His past honors include Young Investigator Recognition Award from the Orthopaedic Research Society, National Research Service Award from the US National Institutes of Health (NIH), a CAREER award from the US National Foundation of Science (NSF), Funds for Talented Professionals (Joint Research Fund for Overseas Chinese Young Scholars) from the National Natural Science Foundation of China. He is elected fellow of American Institute for Medical and Biological Engineering, American Society of Mechanical Engineers, and International Academy of Medical and Biological Engineerin. He was one of the founders and served as co-Editor-in-Chief of Cellular and Molecular Bioengineering (CMBE), an international journal of US Biomedical Engineering Society (BMES). He has served many review panels for NIH, NSF, and NASA. His research has been supported by the Whitaker Foundation, the NSF, and the NIH. He served as President of International Chinese Musculoskeletal Research Society, the Society for Physical Regulation in Biology and Medicine, Member of Board of Directors of Orthopaedic Research Society, and Member of Board of Directors of AIMBE. He also founded the Special Interest Group (SIG) in CMBE in the BMES and served as its founding Chair.